Turnhout (Dutch pronunciation: [ˈtʏrnɦʌut]) is a Belgian municipality located in the Flemish province of Antwerp. The municipality comprises only the city of Turnhout proper. On January 1, 2015, Turnhout had a total population of 42,637. The total area is 56.06 km² which gives a population density of 835.5 inhabitants per km². The agglomeration, however, is much larger, accounting up to 81,473 inhabitants. Turnhout is known for its playing card industry, as it houses the head office of the world's largest manufacturer of playing cards, Cartamundi. Turnhout is also the capital of the administrative district with the same name. The Turnhout city council often promotes the city as "the capital of the Kempen area". 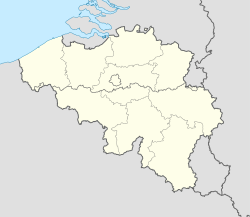 This designation is entirely unofficial, since the Kempen area is far larger than the Turnhout district and does not form an administrative unit. Turnhout serves as the economic and cultural center for other communities in the immediate vicinity with more than 40 schools. There is also an important services sector with two hospitals, a two-stage theatre, an eight-screen cinema and one of the largest cultural centres of Belgium. Turnhout is located at about 51.3 North and 4.9 East, 42 km from the centre of Antwerp, 30 km from Breda and Tilburg, 40 km from Eindhoven. The football club of the city is K.V. Turnhout. Turnhout originated on the crossroads of two major trade routes and in the protection of the hunting castle of the Dukes of Brabant that seems to have existed since 1110 or earlier. This hunting past is still reflected in the city's coat of arms. The small community that developed obtained its Libertas as a "free city" from Henry I, Duke of Brabant in about 1212. In 1338, the privilege of organizing a market on Saturday was granted, a tradition that still holds today. In 1466, a traveler described the well-built houses and paved roads, and counted five churches. By the 16th century, Turnhout had become a wealthy commercial center. Unfortunately, the end of the century brought war, fire, confiscations and epidemics. Suppression and inquisition made many progressive citizens to take refuge in the Dutch Republic, leaving the land of Turnhout impoverished. The further history of Turnhout consists of a series of ups and downs. Many times, the city and surroundings were the playground of armies, resulting in two major battles named after Turnhout: one in 1597 and one in 1789 are referred to as Battle of Turnhout. In 1830, Belgium became independent, and Turnhout fell just south of the new border with the Netherlands. The period of peace between 1831 and 1914 saw the digging of the canal (1846) and the construction of the railroad (1855). In the late Middle Ages, Turnhout was a well-known center for the weaving of bedding articles and of the linen trade. At the start of the 19th century, these trades were replaced by industries based on the use of paper. Pieter Corbeels and Philippus Jacobus Brepols are considered to be the founders of this industry. Turnhout retains much of this industry today. Numerous graphics companies are located in the region, such as Brepols, Group Joos, Proost International Book Production, Van Genechten Packaging, and last but not least Cartamundi, the world market leader of the playing card industry. In addition, the Belgian Centre for the Graphics Industry, and the Flemish Innovation Center for Graphic Communication (Campus Blairon) are located in Turnhout. Soudal, whose headquarters is located in Turnhout, is one of the leading companies in sealants. The Turnhout post office opened before 1830. It used postal code 122 with bars (before 1864), and 367 with points before 1874. Postal code since 1969: 2300. Architectural sights worth visiting are the 12th century castle of the Dukes of Brabant, the gothic church of St. Peter, the beguinage (begijnhof) dating from the 13th century, the 14th century gothic chapel of Theobald and the Taxandria museum housed in a prestigious renaissance mansion. Of particular interest is the Museum of the Playing Card. This is located in an old factory building downtown and houses a beautifully restored steam engine. The beguinage was recognized by UNESCO as a World Heritage Site in 1998. Turnhout is host to the biannual comic festival Strip Turnhout, the oldest comic festival of Flanders, and one of the largest. Every year, there is also the film festival MOOOV (the former Open Doek) which promotes cultural movies. During the summer months, the "Vrij-dagen" are organised. For a certain period, every Friday (vrijdag in Dutch) two artists or bands give a live performance. The event is completely free (vrij in Dutch) and attracts large crowds, strongly benefitting the local economy. Due to budgetary issues however, the "Vrij-dagen" have been discontinued since 2009, when the last edition was held. François du Four, printer and mayor. Constant Janssen, father of Paul Janssen and founder of the N.V. Producten Richter. Flor Joosen (b. Turnhout, 1952) businessman, well known for his caviar business. Hans Van Alphen, decathlete, 4th place in the London 2012 Olympics. ^ Catalogue Spécialisé des Oblitérations Belges, 1849-1910, Nationale en Internationale Postzegelmanifestaties Antwerpen (NIPA), Antwerp, 1999. ^ Liste des Numéros Postaux, Administration des Postes, Bruxelles 1969. Wikimedia Commons has media related to Turnhout. This page was last edited on 4 February 2019, at 10:07 (UTC).